It is one of those days when the mind longs to wander aimlessly and get lost in search of a new inspiration. We take an unknown desert road that leads to a quaint little island somewhere midway between Abu Dhabi and Dubai. Far beyond lay uninhabited lands and roads less travelled, surrounded by a quietly tucked mangrove haven. Between the vast blue expanse of the sky and the sea, a scattered mass of pale green plant life silently continues to thrive. With roots staying afloat on the sheet of water, the mangroves make dull sands seem full of life. An innocent peep from behind their graceful branching pattern takes me to a whole new world. Just then, a blurry image of pink movement is sensed in the modest ambience. Eyes open wide to the sight of countless flamingoes!! They stand on the watery edge flaunting brilliant rosy hues. Some of them fly out in elegant poses juxtaposed against the soft green backdrop of the mangrove forest. It is an entirely new ecosystem nestled secretly inside our mundane unnatural realm. A world that stands independently, in silent celebration of its own rare beauty. I feel alive. Rejuvenated. Occasions like these take one to a high point of being excessively overwhelmed by nature. And then that state of mind melts down into overflowing ideas. It casts a subtle ‘moving ‘effect that makes me still, in intoxicated meditation. Somewhere inside, the landscape architect gets roused. This spontaneous encounter with rustic desert landscapes inspires me to create….create spaces with minimum human intervention; spaces that enclose an untouched silence and exist symbiotically as a part of this living desert habitat that surrounds us; spaces that compliment this naïve beauty of the desert environment without disturbing it. I connected with the mangroves today…and they spoke to me. I realized one cannot separate landscape design from nature. It is something a designer takes from nature in order to give it back in a form that can be interactive and interpretive. Landscape design thus becomes a creative exercise to craft varied opportunities to talk to nature. : : Words and Photographs By Natasha Nair *At Ghanadha Island Site Visit. 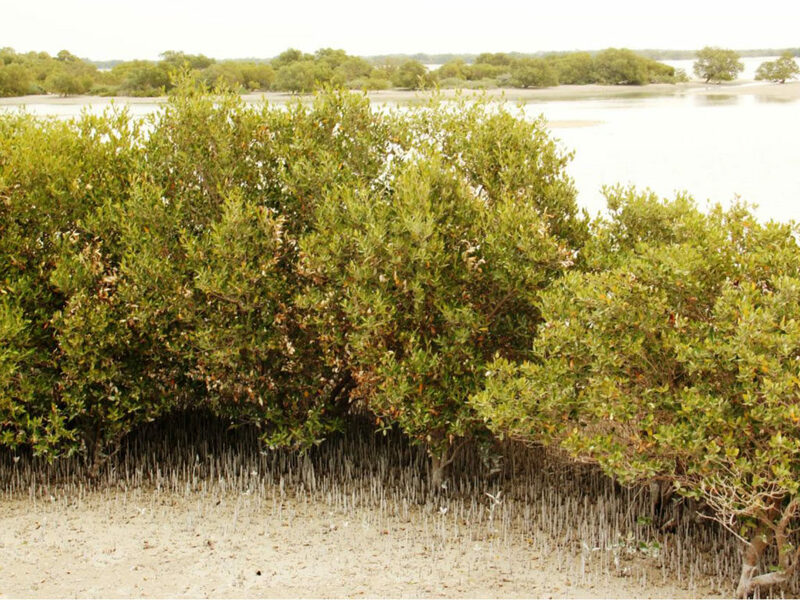 *Mangroves are salt tolerant trees adapted to life in harsh coastal areas. They have a complex root system to cope with salt water immersion and wave action. They can survive in low oxygen (anoxic) conditions of waterlogged mud. Mangrove forests prevent the coastline erosion caused by waves and ocean currents and play an important role in reducing carbon emissions, thereby contributing to lessening the impacts of climate change. These unique marine eco systems cover thousands of hectares along the UAE coastline and form an important and integral part of the coastal eco system in this country. The most common species in the UAE is Avicenna marina or grey mangrove. 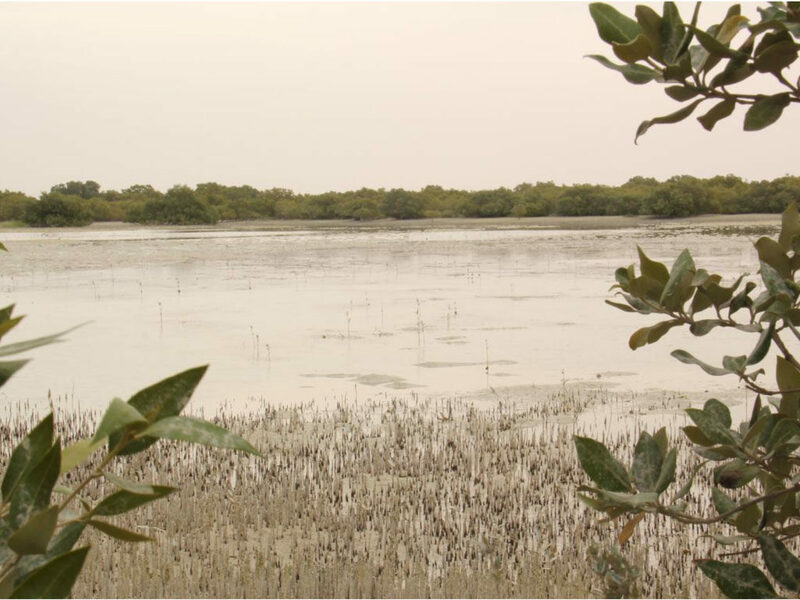 Within the UAE there are approximately 3000 hectares of mangrove forest of which 2300 hectares are found in Abu Dhabi. 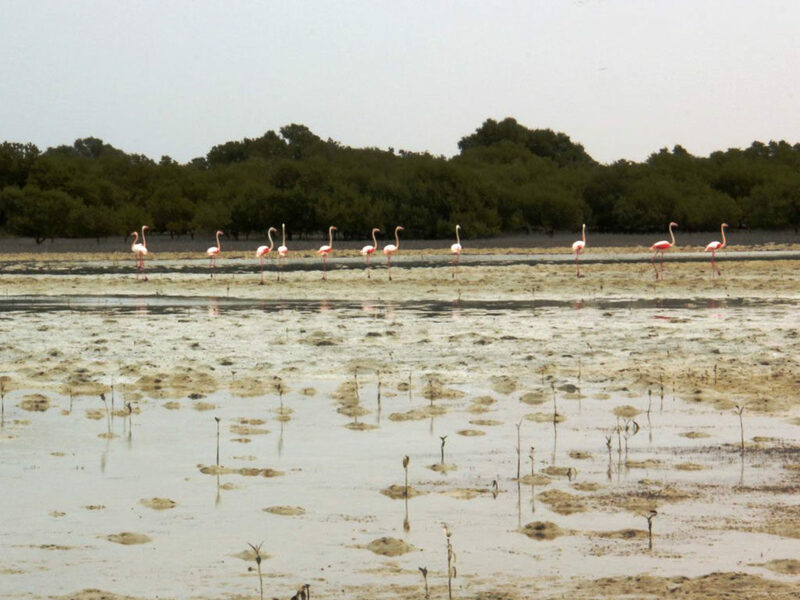 The Eastern Mangroves National Park in Abu Dhabi is home to around 60 bird species such as the Western Reef Heron, Night Heron, Clamorous Reed Warbler, Greater Flamingos, Crab Plovers, Grey Heron, Sandpipers and occasionally Spotted Eagles. It also supports other biodiversity such as fish, shells, sponges, shrimps, echinoderms, and crabs.